Sri Lanka's Paralymic medal winner at the 2016 Rio Para Games, Dinesh Priyantha Herath was feted at a grand felicitation ceremony with the participation of Prime Minister Ranil Wickremesinghe at the Kingsbury Hotel in Colombo last night. Priyantha, who won a bronze medal in the F46 category of the Javelin Throw, brought Sri Lanka's second Paralympic medal, after Pradeep Sanjaya won a bronze medal in 400m in the 2012 London Summer Games. It was the fourth global medal won by Sri Lanka after Duncan White's 400m Hurdles silver in 1948 and Susanthika Jayasinghe's silver medal in the women’s 200m at Sydney Olympic Games in 2000. 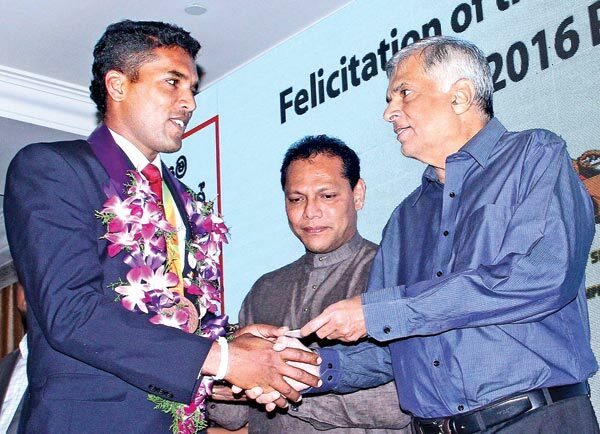 Athlete Herath and his coach Rohitha Fernando were felicitated and gifted by Prime Minister Wickremesinghe together with Sports Minister Dayasiri Jayasekera at a grand ceremony organized by Dialog Axiata PLC, which powered the whole journey of the nine-member Sri Lankan Paralympic team to the Rio Para Games. The medal winner received one million rupees from Dialog Axiata PLC and another 1.5 million rupees from the Sports Development Fund while his coach Rohitha Fernando was gifted Rs 250,000. .
Priyantha, a brave soldier, was injured in December 2008 during the Sri Lanka's victorious three-decade war against terrorism in the North-East region. He gave up doing sports after the injury, but army officials had invited him to continue with the sport javelin. “I had given up the sport but my army officials motivated me to continue the sport. I worked hard during the last six months. I saw my family members only four days during the past six months,” Herath, a father of two children said. Herath's performance at the Selection Trial for the Paralympics, was 55.26 metres but his remarkable feat of 58.23 metres brought Sri Lanka the second Para medal in their history during the 10-day global meet where 160 countries across the world participated. “The self confidence and the belief which Sri Lankan Army soldiers possess are the key points to achieve this great feat,” Sports Minister Dayasiri said. “Look forward to 2020 Tokyo Games as the Government will fully support you,” the Minister said.